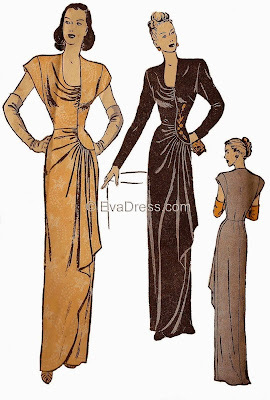 I have changed my plan for the orange crepe and am now using it for the EvaDress 1946 dress with asymmetric gathered design. It's about half-way done, I think. Oh, and then there's that one UFO in my sewing room. A wrap dress with gathers on which I got started last year. I put it aside back then because I didn't really like it. It stayed on the end of the ironing board almost a year and I just tried it on again. And guess what? I don't see any reason not to like it anymore. It still needs sleeves and a hem and then I'll finally have a red dress! And loads of gorgeousness by Madame Gres. Well, it's been a bit quiet here this past week. I've been on a mini-holiday and not a lot of people seemed interested in that crazy trouser pattern. Those trousers are finished but I've been wearing them on Saturday (our first day in the Ardennes) so they are in the laundry now. I'll show them off later. 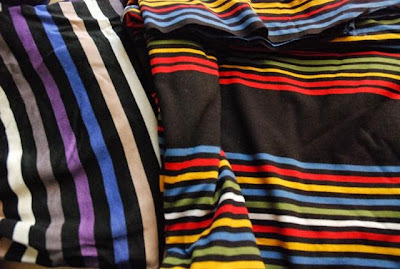 A few weeks ago, a friend and I went to a 'vintage clothes by the kilo' sale. I bought just a few things and this dress was one of them. I picked it out because of the fabric: Rather nice raw silk. The shape is both simple and not so simple: An A-line smock with a lightly quilted, pointed yoke and sort-of-raglan sleeves with pleats. On its own, it didn't look right on me but I liked the look with a belt (no picture of that unfortunately, I didn't feel like trying self-timer pictures today). The sleeve pleats have been carefully made but their placement seems to defy gravity a bit too much. Both on the hanger and on my shoulders, some are drawn open and false pleats form lower down. The collar looks to me like it is made as high stand but it shows clear signs of having been folded down. Whether in wearing or on display isn't clear. 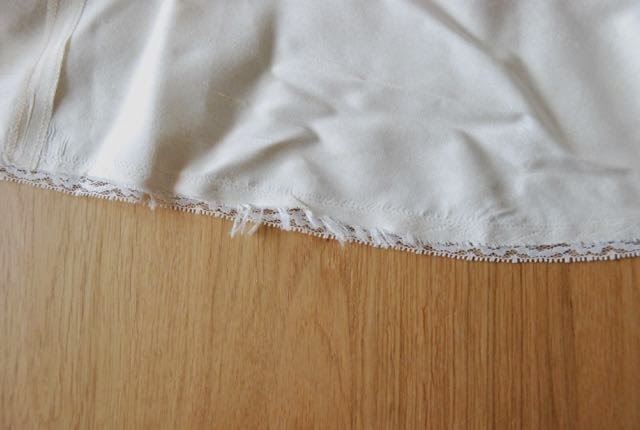 In general, the dress shows very few signs of wear. 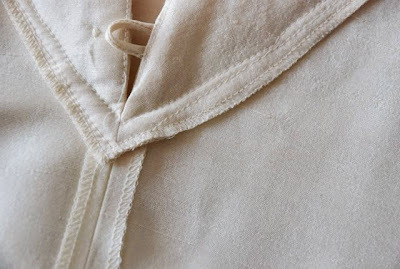 No stains, no wear on the fabric under the arms or at the collar. Not even on the self fabric loops or domed buttons. 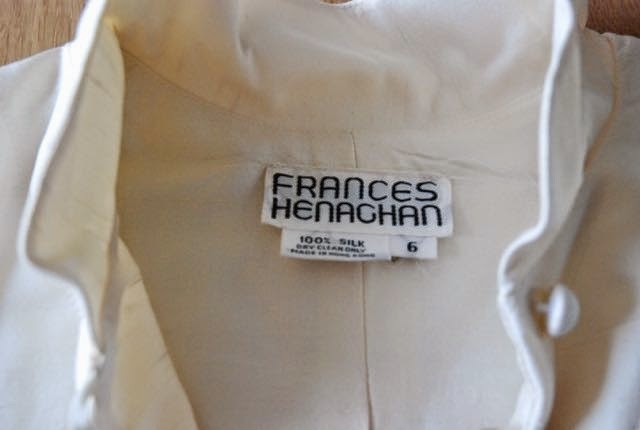 This is the label: Frances Henaghan, 100% silk, made in Hong Kong, 6. 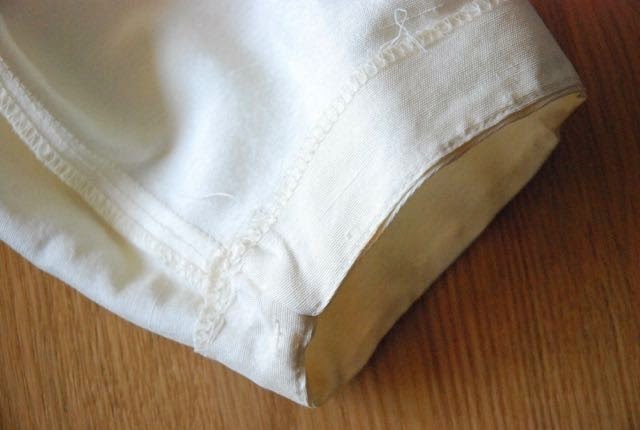 The inside seam allowances are finished with a narrow three thread lock stitch. The yoke is faced with self fabric, the quilting lines weren't stitched through it. 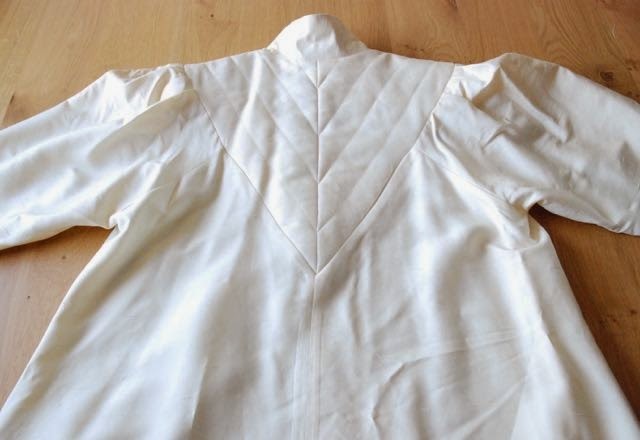 The sleeves are finished with a facing which has been hand-stitched in place. And did I mention it has pockets? In-seam ones, at the sides. Set low enough so I can still use them when I wear the dress with a belt. 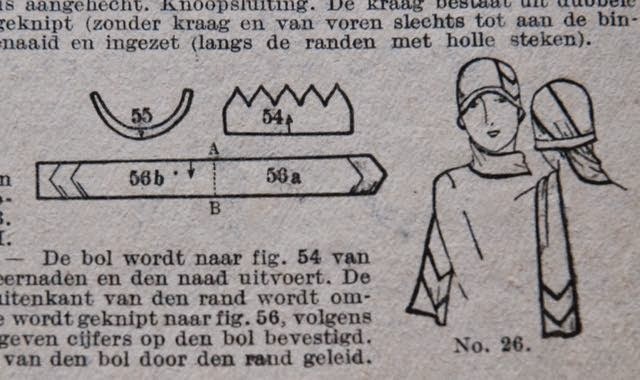 All of this detail is original to this dress. One thing isn't though. The hem. This off-white silk dress, on which all details are made in self fabric and stitching has a hem of narrow white nylon lace. 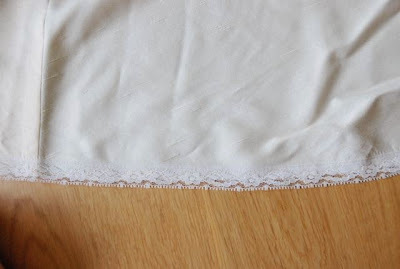 A strip of lace which was just stitched to the raw edge of the fabric... It's fraying. This doesn't look like the work from the same person who made the rest of the dress. I think it has been shortened. So now, I'm left wondering. How old is this dress? What was its purpose? Why was it shortened? The body shape is almost like that of night gown. The sleeves and collar are too formal for that. So is the material. The remaining length is just below the knee for me. Of course, I can't tell how long it has been. It may have been a long dress. 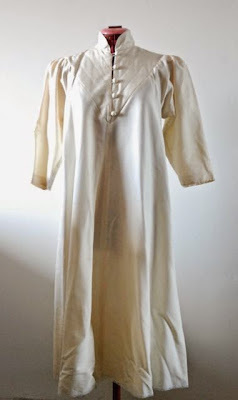 A long, off-white dress. A fairly informal wedding gown maybe? I was sewing up my trousers and I had just found out that I had made a rather stupid mistake in the pattern. A typical example of over-thinking and flawed logic, especially when you know that I actually did it right the first time, while drafting the pattern, and then altered it. The mistake was that I had doubled the amount of width needed in the pleat. Like this. The fronts of these trousers should be wide but this is just ridiculous. And I had faithfully copied this mistake in the instructions here. So, I took out the "add two more" point and added a warning about the last two drawings. And just before I started writing this post, I re-did those and removed the warning. So now the drafting instructions are as they should be. Luckily, fixing this in both my pattern and my trousers only meant cutting a piece off. So, I could continue to make them and to take the promised pictures to illustrate that. 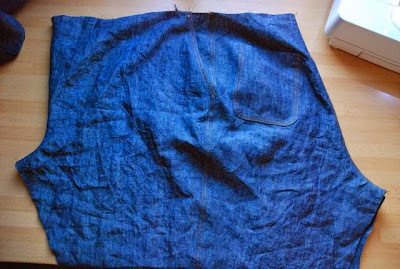 Obviously, you should treat the front pockets and the construction of the back as you would in any trouser pattern. Then, you sew up the center front seam (all of it). (I could only take the picture like this because it wasn't until I had sewn one of the side seams that I realized my mistake). Because my trousers are in jeans-blue chambray, I'm using yellow topstitching thread for flat felled seams. 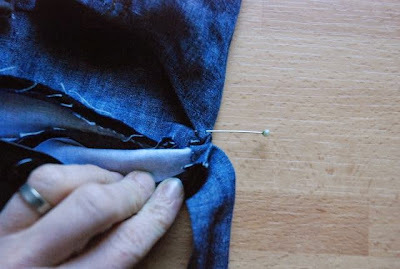 Sew the inner and outer legs seams. Narrowly hem the edge of the fabric around center front, between the notches closest to CF. I like to taper this hem up so its last bits fall inside the seam allowance. 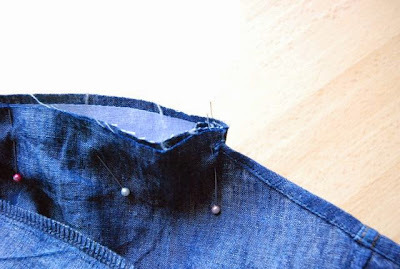 Sew the curved waistband. This is actually even easier than normal because these have a symmetric waistband. When you start on this, you should decide how you want to close your trousers. If you want buttons, you can just go ahead and make the waistband. If you want a tie, like I used here, you have to insert one tie in the right front edge and another in the left side seam. My waistband is is curved and 3 cm high and the ties are 70 cm long and 3 cm wide (finished sizes). 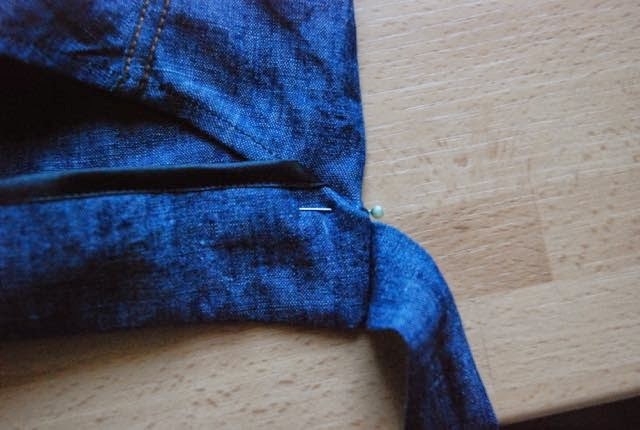 Pin and sew the outside of the waistband to the top of the trousers. 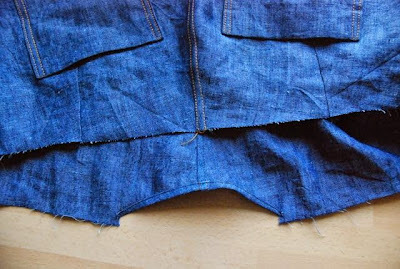 the front edges of the waistband should reach exactly to the notches. Press seam allowances up. I often use bias binding to finish the edge of the waistband facing and keep its seam allowance pointing down. This keeps the amount of bulk, in the waistband just above the seam, down. In this case, it also helps with finishing. On the side which will overlap, the right side for the wearer, fold the end of the hemmed top edge back on the seam allowances inside the waistband. 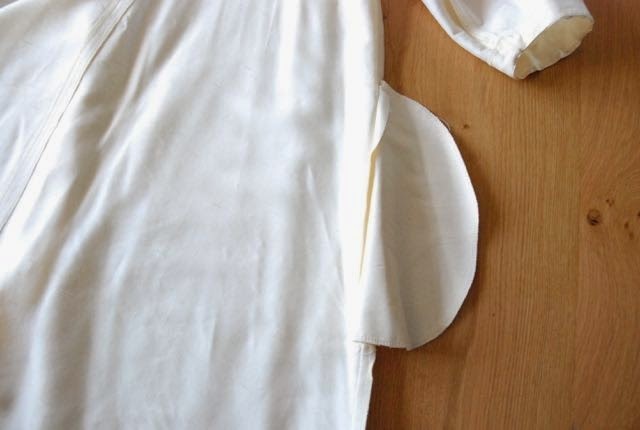 Because you tapered the hem, the rest should easily stay on the outside. On the left side, don't fold it back. Pin the waistband facing in place and sew. I usually stitch-in-the-ditch from the outside. Now, all you need is a snap or a hidden button at the left side of the waistband. Or if you didn't use ties, also a button at the right side. My trousers are finished and I'll try to get some pictures soon to show you the end result and how these actually work to wear. There's nothing like listing your sewing plans to remember other plans... I won't tire you with additions to the list. My mental to-sew list could stretch on forever. I'm now working on something which was and wasn't on my summer sewing list. These will be sort-of summer weight trousers but not the wide legged ones I mentioned (I still want to make those as well). 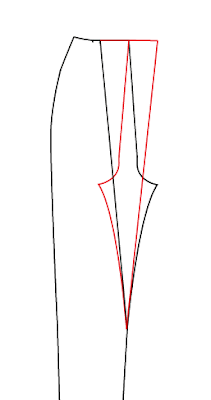 Here's the sketch/technical drawing. wrap-over trousers with tapered legs. 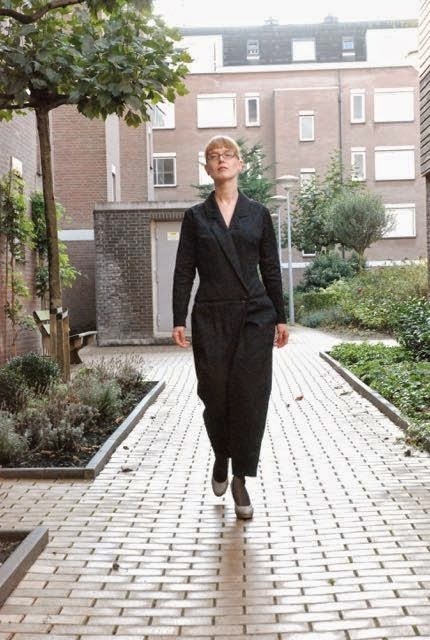 I used a similar style in this jumpsuit I made last year and thought it would also be nice to have separates in this shape. 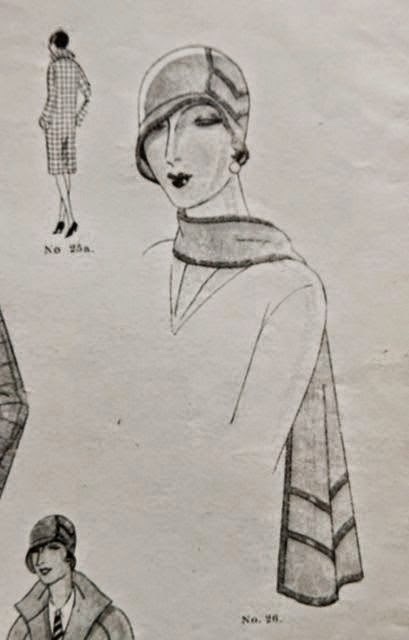 I know there have been patterns for wrap-over styles in sewing magazines but those are usually 'fake'. That is, the wrap-over is real enough but it's just a styling feature not a functional one. Those designs usually have a zipper at the side. Because I'm a bit of a purist, I like mine to use the wrap-over in a functional way, as the actual means to get in and out of these trousers. And I thought it might be nice to try and explain how to make such an odd thing out of a normal trouser pattern. For a style like this, you will need a basic pattern which is loose fitting in the seat and thigh areas. 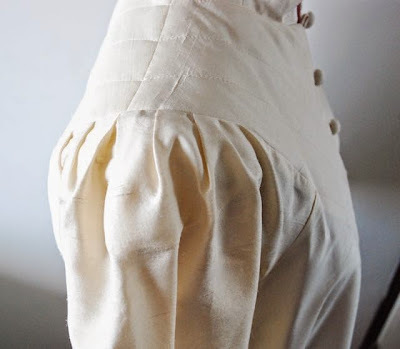 I'm using the same adaptation of my sloper as I would for pleated trousers. This version of the sloper has a slightly lowered crotch and a bit of added ease at the hip and thigh. 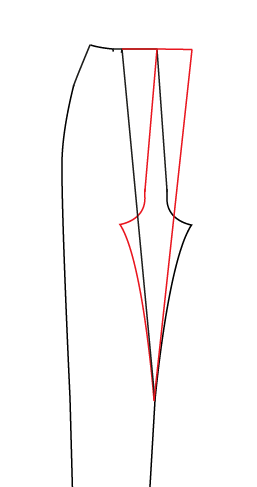 I'll show you the alterations to the front leg pattern piece. The back leg doesn't have to be changed at all. 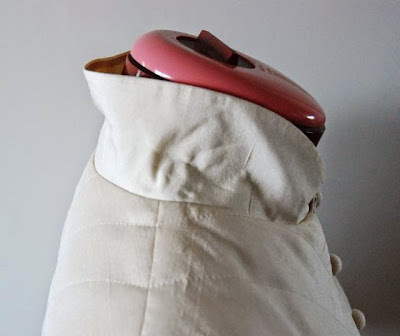 If you are using a sloper, it will probably have a small waist dart. Remove that by taking out its width at the side and/or center front. 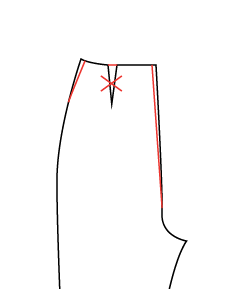 Draw a line from where you want your overlap to end (I usually put it at the point where the dart used to be) to the knee point on the inner leg seam. Trace the top edge from the beginning of the line to center front on a new piece of paper connected to the rest of the pattern and then cut along the line. 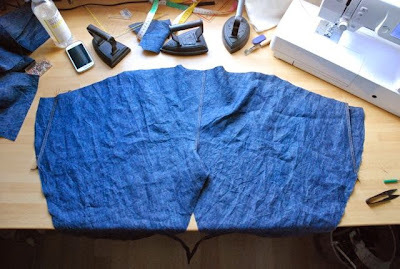 Now, to create the wrap-over fold, mirror that front piece and connect the tops of the center front line and the point at the knee. Trace the top line again. After that, put the center front piece back on, connecting it two the pleat you've created. 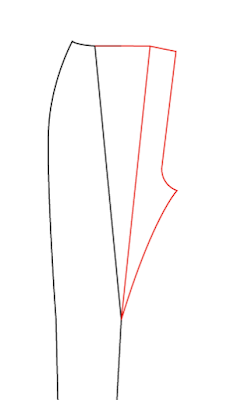 Make sure you mark the beginning and end of the pleat (the black notches) and its center (the red one). 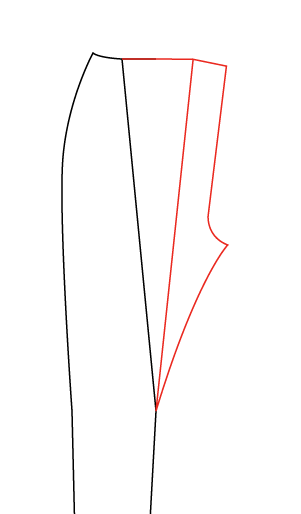 The straight grain remains in its original position running along the length of the leg. 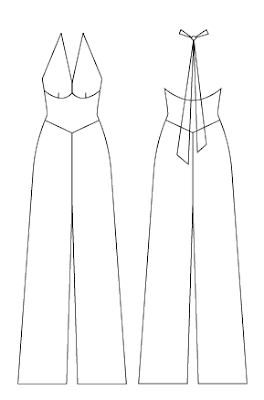 This pattern piece will be used for both the left and right leg and needs to be finished with a waistband which either connects to the entire drape/pleat or only to from the side to the notch closest to CF (which I prefer because it doesn't create as much bulk at the waistline). I will take pictures while I am sewing to show how this thing should come together. I've made another new dress... I had actually started to draft the bodice for this one the day before I started work on the party dress, so it made sense to pick up where I had left off. 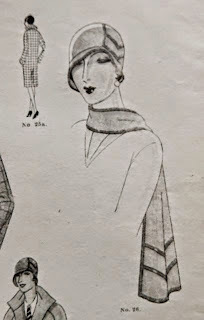 This is a typical example of a garment inspired by the fabric. I've had the blue cotton of the skirt in my stash for a few years. It's a nice quality cotton with a subtle kind of glow to it but it's also a bit on the thick and stiff side. 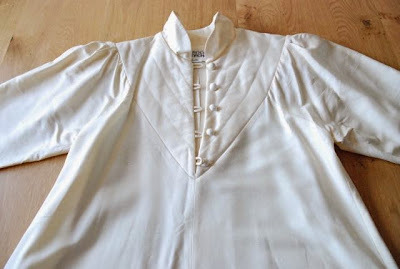 I've used it for my very first project from a vintage pattern, the Marion dress, and then again last year, for the blouse for my 1957 outfit. Which, by pure coincidence, was also made from a pattern from the sewing magazine Marion. The dress didn't quite work for me, I've hardly worn it and given it away during some wardrobe-clear-out in the past years. I still love the blouse. There were still two meters of this fabric left in my stash when, earlier this year, I found the blue jersey at the market. 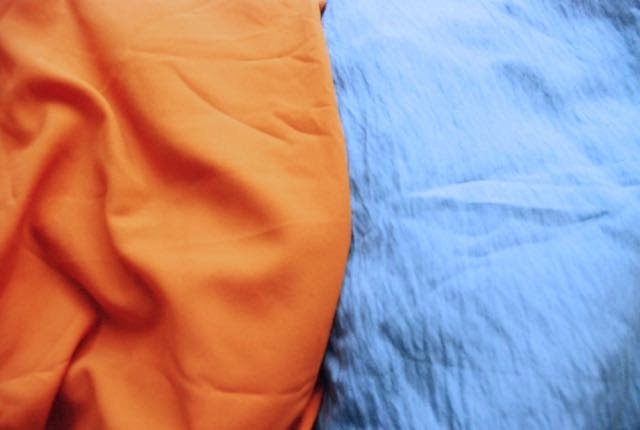 Nice cotton jersey, in a colour which suits me and on sale. Of course I had to buy some. And I immediately thought it might match some cotton in my stash (either this stuff or another piece of slightly darker and thinner cotton). In fact, the jersey matched both pieces of cotton but I liked this combination the best. 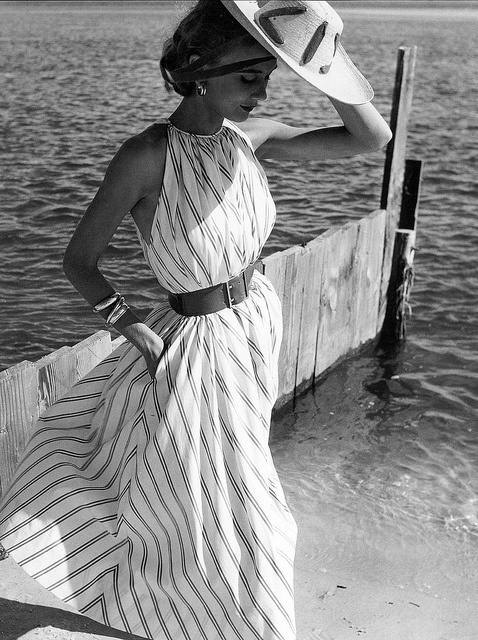 In my sketch, I imagined a dress with this top and a more A-line skirt with a few sharp pleats. 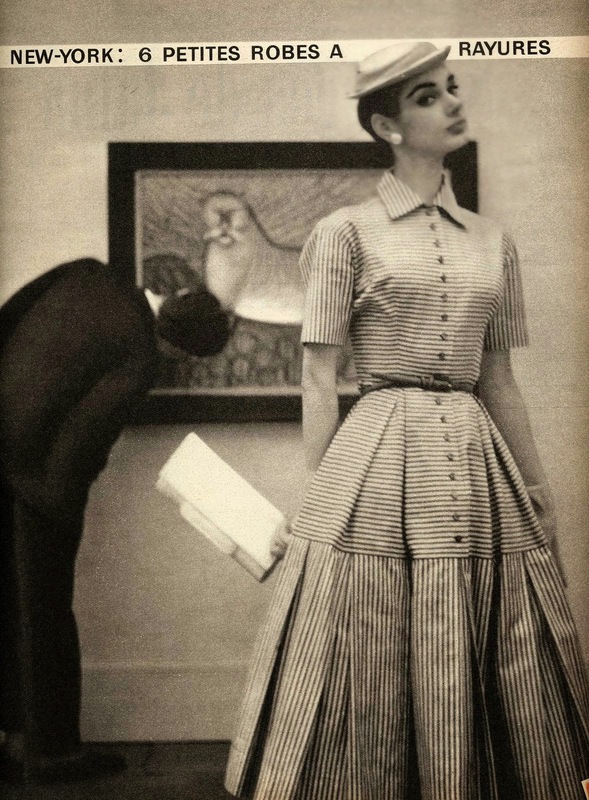 When I had started sewing on the top however, I kept thinking about the lower-waist dresses from the mid-1950's. Those usually have a fitted bodice and a very full gathered or pleated skirt. This particular example from Marion magazine is not very glamorous but shows the principle pretty well. 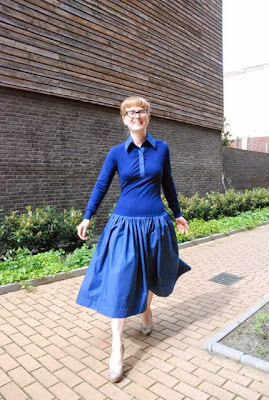 I've made sort-of retro flavoured dresses with lower waists before, both in woven and knitted fabrics but it's a nice and different style to play around with. This version has a slightly longer bodice than the previous ones, long sleeves a shirt collar and button tab and a full gathered skirt with slash pockets at the side seams. And I've hemmed the skirt about 10 cm longer at the back. It could do with some extra 'pouf' in the skirt but my usual fluffy petticoat starts building up width close to the waistband so it would have to be worn really low on the hips to work under this dress. I'm happy with the bodice but wasn't quite sure about the look as a whole when I first tried on the nearly finished dress. E said he liked it though and now, after hemming I tend to agree. And it is really comfortable. P.S. I didn't really feel like posing for pictures but I wanted to be able to blog about this dress so I did it anyway. And somehow I managed to look angry or have my eyes closed in just about every image. E served as photographer but didn't notice. Usually I edit out pictures in which I make such faces but in this case that would have left me with just one. Some people who sew plan ahead. They start sewing for warmer weather at the same time the first summer clothes appear in stores. Of course, if you were building up a new wardrobe from scratch that would make sense. Otherwise, you would have nothing to wear by the time the weather changes. The reality of many of our lives is different: We have clothes to wear, we would just like to add different ones. We may need new things in some categories but usually not a whole wardrobe. As a result, I usually react slower. When the calendar says it's spring, I start thinking about what I could make for the coming season but I rarely take action until it actually gets warmer. In this past week, it is turning summer-y outside. 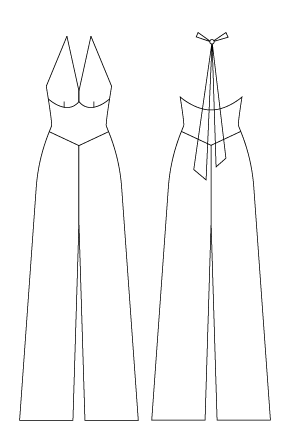 At the moment I'm working on a dress for which I started to draft the pattern before making the grey party dress. It looks promising so far but not particularly summery. As for wardrobe needs, I could do with another pair of wide-legged trousers in a fairly thin fabric and maybe a couple of simple tops. And a simple dress in a jersey fabric. You know, the sort of thing that's nice to take with you when going on holiday. I have fabric for those things. 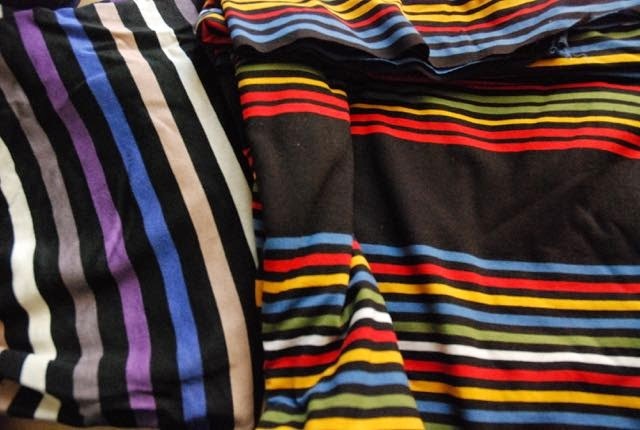 The brightly coloured striped fabric on the right is a nice quality cotton jersey with lycra. It should be nice as a simple fitted dress. The other one is linen or something and doesn't have the same stretch and recovery. It's nice but better suited for looser shapes. Of course, I still want to make this dress from orange and white striped cotton. I've wanted that one for at least a year now. And something sort of like 1930's beach pyjama's in this sky-blue viscose. It's always difficult to photograph plain fabrics well but I think I managed to get something close to the real colours here (maybe the picture is a bit too light). The orange is crepe. I think it would work well for a 1920's dress. If there's enough of it. 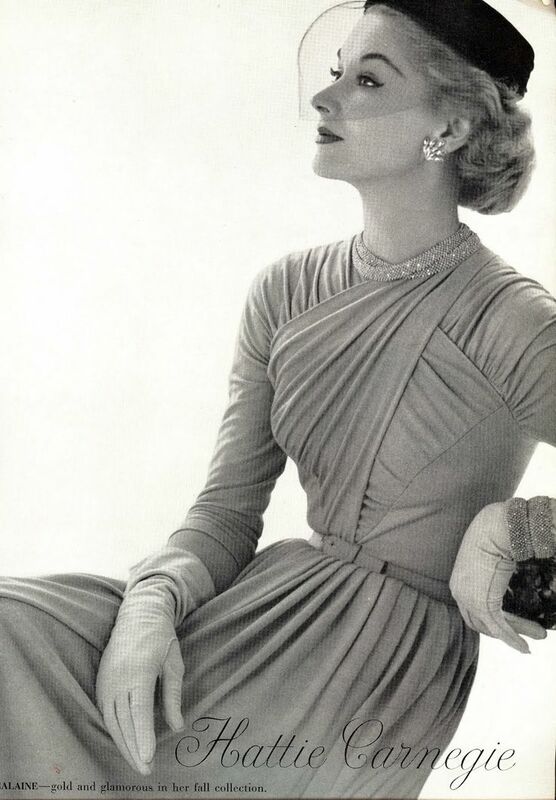 And of course I still want to try out a draped and gathered 1940's design. This one from EvaDress is an option. 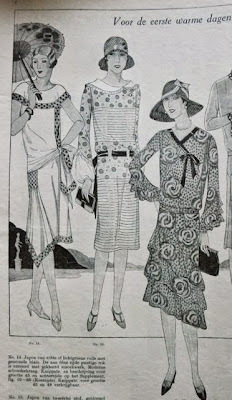 Or one of two Vogue repro patterns I have. Or a real vintage one. Plenty of ideas which, as usual, may be subject to any number of changes of mind. I am looking forward to make at least some of these though. Have you started sewing for summer yet? And what do you want to make? If you've just found my blog, welcome! I hope you won't be disappointed. Spectacular structured and draped dresses are part of my repertoire but most of the time, I make more ordinary things. 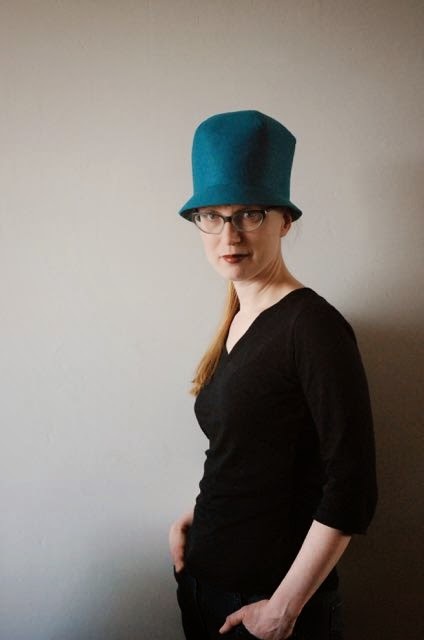 Today, I thought I'd show you some hats I finished just before I started to work on the party dress (but I didn't get a chance to take pictures straight away). 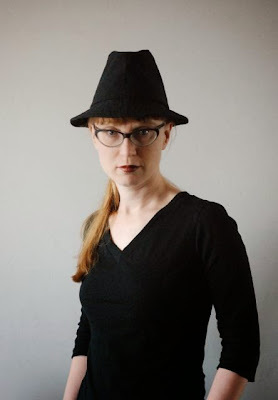 There's the cut-and-sew fedora for which I took the pattern from a RTW hat. I had plenty of criticism on it in my earlier post but it looks really good in the picture. Better than in real life, I think. It's definitely worth trying to make an improved version of this one. Of course, you have already seen the hat I made to go with my suit. I just didn't include a close-up in that post, nor a clear picture of the back, which has the decoration. So here it is. And then there's a hat you haven't seen yet. When I went to the haberdashery store to get some supplies for the first hat, I also found rolls of thick felt. Synthetic stuff but it still seemed rather suitable for hats. 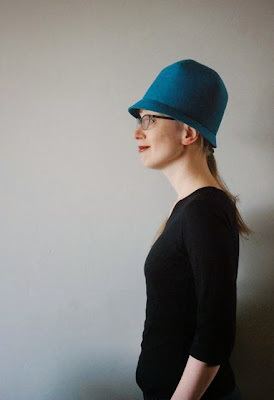 I bought some of it in a lovely bright turquoise colour and decided to use it for a 1920's cloche. I used this design from Gracieuse magazine. The pattern looks like this. 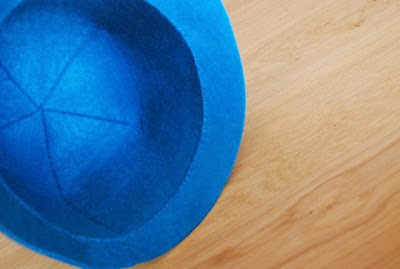 You were supposed to use something like wool jersey which some kind of millinery net to support the hat shape. I just used the felt, which is pretty thick, and didn't add the scarf. 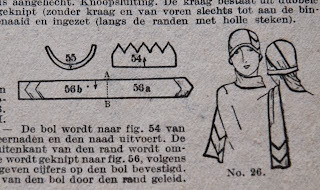 Making the crown from one piece with five points is very different to anything I've seen in more modern cloche patterns but it seems to have been the standard method according to Gracieuse in the 1920's. I've found three other examples which were constructed in the same way. I had to enlarge the whole thing by about 2 cm to make it fit my head. Because the felt was so thick, I decided to cut the pieces without seam allowance and sew them edge to edge by hand. I tried to smooth the shape a bit more by steaming the seams with my iron but that didn't work. This isn't wool which can be shaped by heat and steam but a synthetic fiber. Ironing only made the felt softer so I stopped quickly. I kind of like the result. 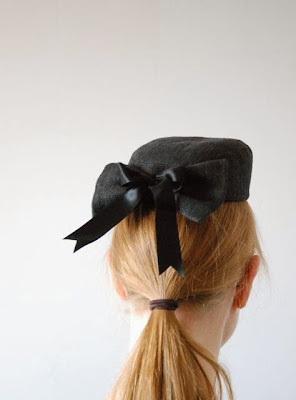 It's a fun hat and, like all cloches, practical in that it can't be blown of your head quite so easily. It doesn't really look like a design that's about 90 years old though... but it really is. And that also makes it another entry for this year's Vintage Sewing Pattern Pledge. The third one. Or maybe the fourth. I'm not sure whether or not the first hat counts as well. That one was made from a pattern which I bought new several years ago and although all the hats in it have an obvious retro flair, Vogue doesn't call it a vintage style pattern (although this pattern may have been printed before vintage was very popular, I think I've had it for about 7 years). Either way, my progress this year is a lot faster than it was last year. A (pre-New Look) 1940's dress or another go at a 1930's design should be next. And here it is! 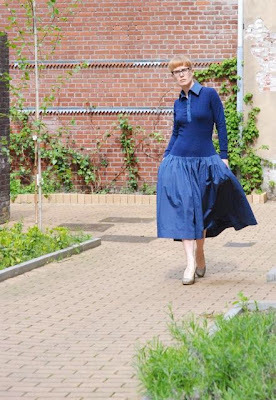 The dress I've been working on and blogging about for a little over a week. Just to recap: We were invited to a friend's wedding but didn't know about it until a week and a half before the date because our invitation had got lost in the mail (we later found out that the same had happened to a two other guests as well). At that point, I decided to try and make an appropriate dress. A dress I have had in mind for a year or so. Obviously, I've taken these pictures after this particular garment met its destiny. I wore it yesterday to the wedding of our friends V and A. So, before I took these pictures, the dress had already survived a car ride, sitting and standing, cake, drinks, dinner and crazy dancing... So I hope you can forgive a few creases (I tried to iron the skirt before taking pictures but sat on it again to put my shoes on). For this dress, I don't have to give technical details now. You can read all about those in my posts from the past week. I will repeat this: I've had the idea for something like this because I thought it would be great to combine all the different skills I've acquired over the years: Not just in sewing but also in pattern making, lingerie, corsetry and bridal wear. Which is why it had to be a strapless dress with bra-style underwired cups, covered with the kind of draped fabric often seen on bridal gowns with a skirt which has a Pattern Magic knot. A few things I didn't tell you yet: I used spiral steel boning in those boning channels. I had pre-tipped bones but some were too long, so I tried making tips from electrician's shrink wrap for the first time, which worked very well. To make sure I could get in and out of the dress on my own, I added a little trick I learned when altering wedding dresses. Those bits of elastic which stick out through the lining at waist level are connected to the structure layer inside. When you put the dress on, you close the lingerie hook-and-eye on the elastic strap first. This holds the dress in the right position and allows you to devote both hands and all your attention to zipping it up. About that zipper... I went with a rather heavy metal one. There are a couple of reasons for this. First of all, I don't trust invisible zippers for closely fitted strapless bodices. I just don't think they can take the strain (I've come across one bridal wear brand which thought they could. I remember because I've had to replace a few of those zippers...). The obvious alternative would be a normal zipper. Preferably set in as a lapped zipper. 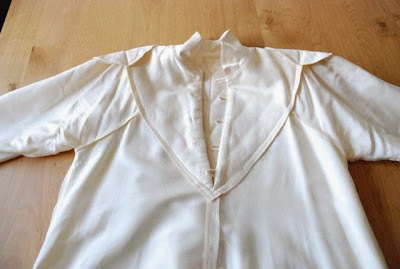 But that tends to work badly with all those layers in the bodice. 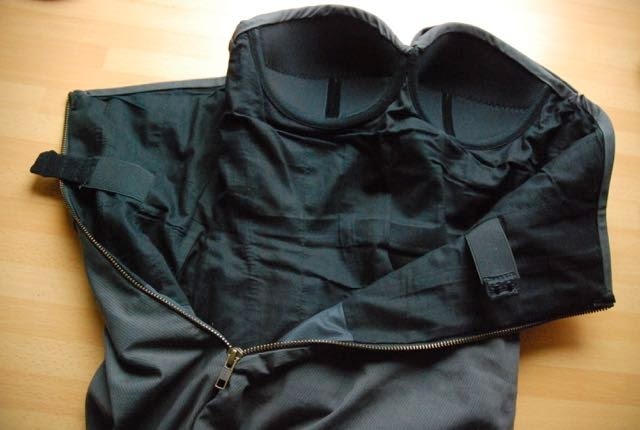 Often, the overlapping piece has a tendency to stick straight up instead of covering the zipper. So, I went the other way. I'm not hiding the closure. And if you are going to see it anyway, I like a metal zipper. Just a bit of added edge. As I do usually, I set it sort of like an invisible zipper so you don't see stitching on the outside. And I can report that I'm not at all disappointed by what it was like to wear this dress. I was a little bit anxious about that. After all, I've given plenty of instruction about how behave when wearing a formal, strapless dress but I had never worn one myself. It's not like wearing a t-shirt, obviously, but this custom-made one stayed in place perfectly and wasn't uncomfortable. 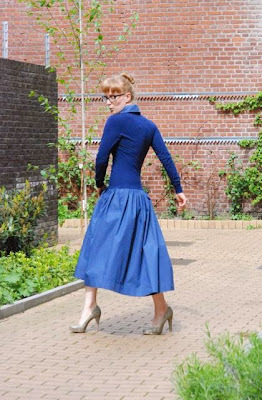 The skirt allowed for plenty of room to walk and its ties remained nicely in position and that bolero was just the little cover-up I needed. All in all, I'm quite pleased with this dress. It may just be the most complicated single item I've made and I'm really glad it all worked out as planned.